Former Aston Villa and England striker Gabby Agbonlahor has retired from football aged 32. 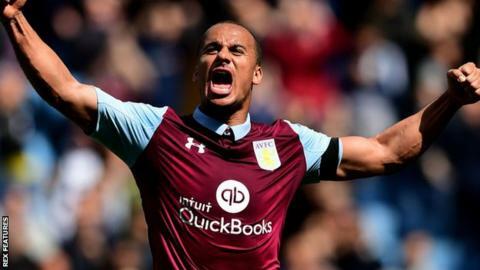 Agbonlahor had been without a club since leaving Championship side Villa at the end of last season, his last appearance coming in December 2017. He scored 86 goals in 391 appearances for Villa, while he also won three senior caps for England. "The time has come to officially retire and watch Aston Villa as a fan," Agbonlahor posted on Instagram. "If I would have been told at school I would play nearly 400 league games, be the record Premier League goalscorer for Aston Villa, captain the great club and represent England at senior level, I would have laughed. "I want to say thank you to all the supporters, the staff I have worked with at a great club and my ex-team-mates. "The thought of playing for another team or playing against Aston Villa was something I just couldn't do. I look forward to whatever the future holds." Agbonlahor was a key part of the Villa team that finished sixth in the top flight for three consecutive seasons between 2007-08 and 2009-10. He also played in their 2010 League Cup final loss to Manchester United and came off the bench in their 2015 FA Cup final defeat by Arsenal.